JoJo performs at Royale Sunday. It might be grad-party season, but on Sunday night, Royale held a homecoming — and the Foxborough-raised singer JoJo was its queen, strutting through a fast-paced, 19-song set that showed off her formidable voice and no-nonsense attitude, while also making plain how much her sizable fanbase had come to adore the singer over her decade-plus career. 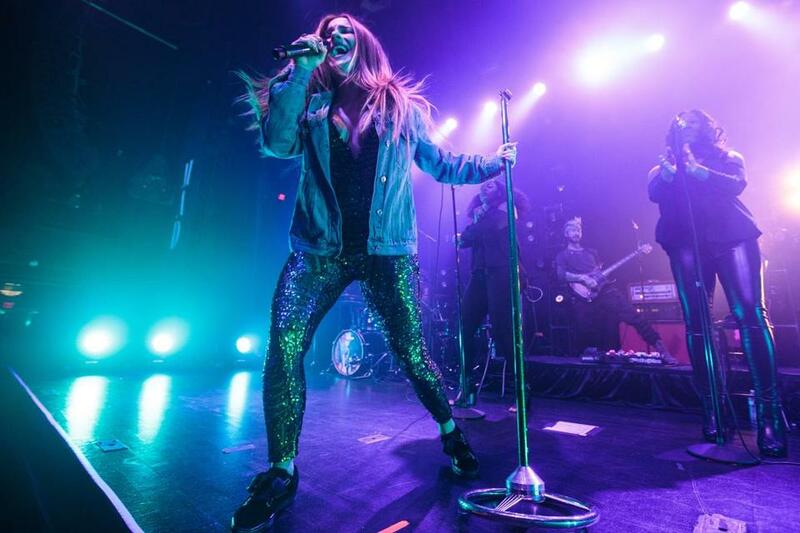 JoJo broke through in 2004 with “Leave (Get Out),” a strummy, yet strident slice of teenpop that introduced her to the “TRL” faithful; two years later, the chimingly chiding “Too Little Too Late” hit No. 3 on Billboard’s Hot 100. But legal wrangling with her former label left her in limbo — until she decided to go the mixtape route with independent releases that revealed her matured, yet still vibrant instrument and nascent interest in hip-hop. She wound up being particularly taken by the moody, vulnerable songs put forth by Drake, recording an answer song to the Canadian MC/mogul’s 2011 track “Marvins Room” that put ladies-first feistiness out front. The success of her self-released music led to “Mad Love.,” her first album since 2006, coming out last October; it places JoJo’s muscular soprano among textures inspired by R&B of old and new, with fierce lyrics that celebrate self-reliance while chronicling romance with honesty and wit. That forthrightness manifests throughout JoJo’s music and lyrics, and on Sunday it energized her show — she wept while singing “Music,” the heartfelt tribute to her late father, coaxed the audience to be nicer to themselves before the uplifting “I Am,” and discussed her struggles with depression before the pulsing “Save My Soul.” It wasn’t all serious — she playfully seduced a showgoer during “High Heels,” and gave copious shout-outs to Boston, while the singalongs with older tracks like “Leave (Get Out)” and “Too Little Too Late” gleamed with early-21st-century optimism. But it was very human, and the audience hung on every syllable, screaming along when the mood struck and watching her in quiet reverence during the night’s more subdued moments. JoJo’s voice has a fizziness that sets it apart from other present-day pop hopefuls, and it’s incredibly strong as well — if her barn-burner performance of the torchy title track from “Mad Love” didn’t prove it, her decision to drop in a bit of Mariah Carey’s siren call “Vision of Love” certainly did. That medley, and the show-closing house banger, “Good Thing,” made plain how JoJo has become, on her own terms, one of pop-soul’s brighter lights. She can tell stories through her banter and her belting, bringing the crowd closer while getting them to lustily sing along.